This week, I have a dessert recipe from Crissy Page of Dear Crissy that I procured from BlogsRelease. This recipe intrigues me because I am not particularly fond of banana pudding. I find it to be too rich, even though it does taste good. This recipe has something that adds a refreshing, lighter component to cut through the richness. Plus, the smaller size doesn't hurt either. Mix all but ¼ cup. wafer crumbs and butter in 13×9-inch baking dish; press onto bottom of dish. Bake 8 min. Cool 10 min. Thinly slice two cups of fresh strawberries. 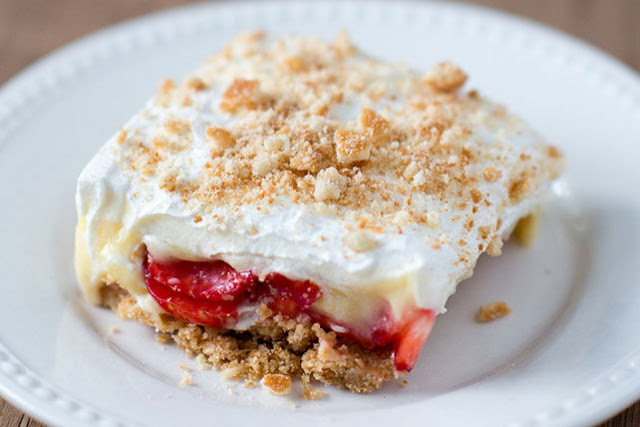 Top crust with sliced strawberries. Beat pudding mixes and milk with whisk 2 min. ; spread 2 cups pudding over strawberries. Stir 1 cup COOL WHIP into remaining pudding; spread over the dessert. Top with remaining whipped topping. Refrigerate 3 hours. Sprinkle with remaining crushed vanilla wafers when ready to serve. If you like a warm component with your cold desserts sauté sliced bananas in butter and sprinkle a little sugar (white or brown) over them to help caramelize and sweeten. Cook for 5 minutes or until golden brown. Drain on and place a banana slice or two on your bar.